The GPE48350E embedded power system consists of the power distribution frame, monitoring module and rectifier module, with functions of AC lightning proof and DC power distribution. The monitoring module supports outside signal input, communication transformation, AC/DC detection and contactor control. The whole system is of high reliability and performance, and can be operated through PC software. 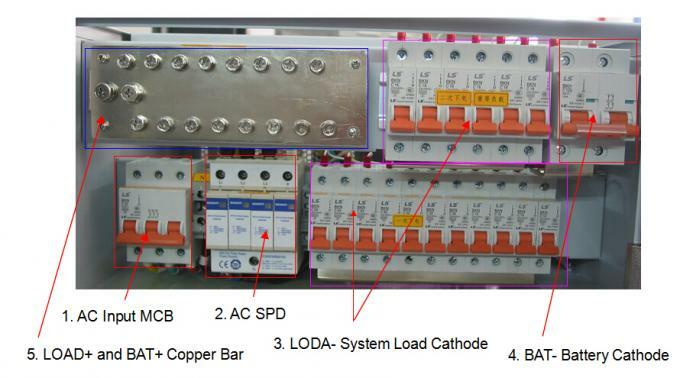 Lifecycle of battery prolonged by perfect battery management, including electrical charge/discharge management, battery temperature compensation, battery capacity test, reversal connection proof protection, low voltage protection etc. For details, please refer to the specifications of modules. AC power is first input AC-INPUT MCB and then feed into the rectifier module after lightning proof and filtering. AC-INPUT acts as protection to over load and short circuit to AC power. The user’s battery is connected to the DC output side through MCB BAT and KM2, and the circuit breaker provides disconnection control, over-load and short-circuit protection to the battery. Under normal conditions, every parameter of rectifier modules and power distribution unit are all under control of the monitoring module, operating according to the pre-set parameter or user’s commands. If AC mains faults, the battery will power to the system. With the battery discharge, the terminal voltage of the battery starts to descend. When battery voltage is under -47V±0.5V, the monitoring module sends DC under voltage alarm signal and when battery voltage is under -46.0V±0.5V (adjustable), the KM1cuts off non-priority loads and retaining power to priority loads. If battery voltage drops to -43.0V±0.5V (adjustable), the KM2 will cut off output of priority loads and then the power system will stop working. If the external AC mains recovers, the system will normally work again. (All above monitoring data are system default values and can be reset by user). Except for battery over-discharge protection, battery or load over-temperature protection is prohibitive under default, users can send command to activate or inactivate according to the demanding. forced cooling by fan mounted on rectifier, face in, back out. The fan is mounted on rectifier front panel; can be disassembled. Fans include temperature control speed adjusting function. 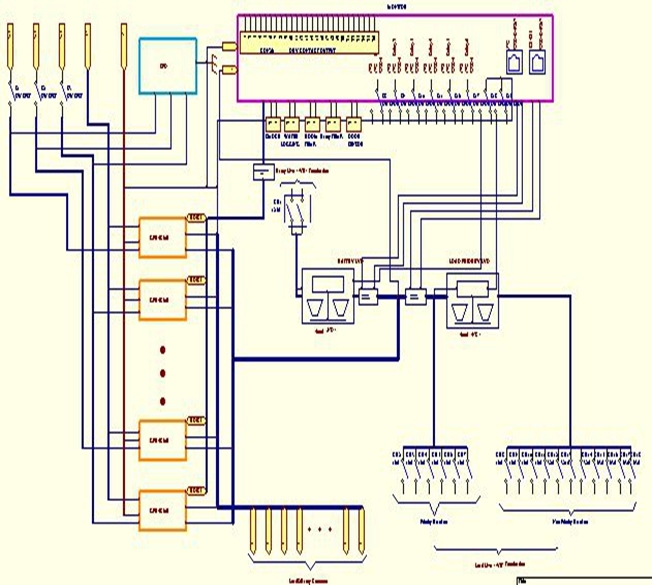 First insert the embedded power system to the specified location till the system is well fixed. Keep the 8 fixing holes on the bracket in line with those on the cabinet and then screw up 8pcs M6 cross rounded head screws. Finally complete the installation after tightening the screw. 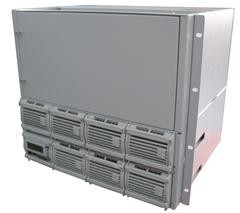 Electric connection between main cabinet and external equipment includes: connection of AC input line, connection of DC output and battery, connection of communication cables, connection of GND cables. The main requirements of electrical connection are safety and reliability. The following are detailed description. The connectors for AC input cable are 3PIN MCB and rail type connector at the front panel of system. The AC cable can be directly crimped to MCB input terminal. system. The cable can be directly inserted to the MCB. a. The specifications and model of the cables shall be according to the engineering design requirements. a. Prepare positive connection cables and negative connection cables(including terminals and polarity identifications ready). PE connection: The GND section is near the left bracket of system. Connect the chassis GND point of system main cabinet and external earth with cable of 10mm2 above. LAN and RS-485, communication interface of GPE48350E, locates at the monitoring module, function for communication with the host. LAN Ethernet communication code: Directly connect to the PC with cross wires or with common wire through a router. a. Connect one end of communication cable to RS-485 interface on monitoring module of GPE48350E. to RS485- at RS-485 converter, connect COM interface of PC through RS232 port on the converter. The rectifier modules and monitor module are connected on back panel of system GPE48350E, through which DC output goes to current collection bar; control signals of the monitor modules drives the contactor; SPD within distribution frame transfers signals to monitor; monitoring module and rectifier module communicate with each other; signals of current sharing goes into monitoring module. The host can conduct enquiries, settings and control upon the monitoring and realize the remote message, remote sense and remote control. To send controlling orders to or get data from the rectifier module via RS485 communication. To manage the low voltage, power down, equalizing/float charge, temperature compensation and capacity testing of the battery. For details, please refer to specifications of “GPM48P”. Please refer to “Instruction of PC Software” documents for the detailed information. Tested with each of 0.1uF ceramic capacitor and 10uF electrolytic capacitor with 20MHz band width. 2. when external voltage above over voltage protection point is added, module works normally. Handles on panel of rectifier module are equipped. When inserting module into the main cabinet, the operator shall clutch the handle with one hand while holding it with the other hand. Slowly push the module into its slot until the connection terminal on back of the module inserted into corresponding socket of system bar in the main cabinet. Finally, finish the installation by firmly fixing the screw on the panel to the main cabinet. When removing module from the main cabinet, first screw off the bolt on panel then slowly remove the module from its slot while clutching the handle. Maintenance solution: check the communication network to see whether the internet connection is loose or internet interface is damaged or not. Maintenance solution: check whether the fan is blocked, load current exceeds the max. value; AC voltage is too lower, then the auto rate decrease starts; over temperature pre-alarm starts; remote shut-down is started on PC software. Maintenance solution: check whether the voltage is too high/too low and over/under voltage protection is on; fan is blocked; ambient temperature is too high; load is short circuit or not. If above mentioned parts are ok but the red LED is still on, then there is problem on the module, please return it to factory for repairing. Maintenance solution: Firstly check whether AC input is available or not, if not, then check the electrical circuit; if yes, the module is in malfunction, please return the module to factory for repairing.